On the afternoon of August 26, 1871, a porter at the Hudson Railroad Freight Depot on 30th Street near Ninth Avenue noticed an intolerable stench coming from a small trunk delivered there earlier for shipment to Chicago. The porter summoned the baggage master, who decided to open the trunk. Prying the lid open, he removed a quilt and then an old blanket, and so discovered, doubled up inside, the naked dead body of a lovely young girl of about eighteen with abundant long auburn hair, and signs of incipient decay about the pelvic region. Astonished, the baggage master alerted the police, who posted a guard around the trunk, which was already attracting scores of the curious. A boy on the scene named Paddy recalled that the trunk had been delivered on a truck by a plainly dressed young woman who asked him to take the trunk to the baggage room. Informed by the boy that she would have to buy her ticket first, she then went with the boy to the ticket office and bought a ticket to Chicago. She told Paddy to be careful in handling the trunk, as it contained glass that she was sending to a friend. The boy and the truckman carried the trunk to the baggage room, where it was checked through. The woman then told the boy to meet her there at 7:30 p.m. to show her what car to enter, and left. The boy wondered why she had come so early, since there was no train to Chicago until 8:00 o’clock that night. THE EVIL OF THE AGE. “There is a systematic business in wholesale murder conducted by men and women in this city that is seldom detected, rarely interfered with, and scarcely ever punished by law,” said reporter Augustus St. Clair, the author of the article, which affirmed that thousands of unborn infants were being murdered, and thousands and thousands of adults ruined in health and happiness, but so secretly that it was difficult to obtain evidence and witnesses. Most abortionists, St. Clair insisted, were rank impostors without any knowledge of medicine. The men were often former barbers, shoemakers, glaziers, and the like, and the women former midwives and nurses who therefore had some fragments of medical knowledge. St. Clair then went on to recount the visits he had made to all the abortionists whose ads appeared regularly in the Times’s racy competitor, the New York Herald. What followed was a roster of the city’s abortionists, from Madame Restell, the queen of the trade, down to the very dregs of the profession. Among those quoted was a Madame Grindle, who insisted that hers was a noble work, saving poor, unfortunate women misunderstood by society, and a Madame Van Buskirk, who assured him that, in the event of a dead body, doctors and undertakers could be found to “fix” the matter. That the Times managed to pull off such an exposé at this point is amazing, for it was in the midst of its campaign to destroy the Tweed Ring that governed the city. But the article made quite a splash, and the news of a trunk murder a mere three days later rekindled the public’s interest and provoked a vigorous police investigation. Eager to apprehend the murderers before morning, when the newspapers would warn them that the body had been discovered, Police Inspector Walling stayed in his office all night, directing all precincts by telegraph to search for a wagon matching Paddy’s description. Meanwhile the unknown victim’s body, removed to Bellevue Hospital, was decomposing into a swollen black mass of corruption, leaving the police only a lock of hair with which to identify the corpse. Hundreds braved the smell over the next few days to view the remains, ostensibly in hopes of identifying them. The next day brought a break in the case. At 3:00 p.m. Walling, besieged by reporters and the curious, got a wire from the 18th precinct that the truckman being sought had come forward voluntarily. Going to the station house, Walling met the truckman, Pickett by name, who said a lady had had him pick up the trunk at 687 Second Avenue and take it to the depot. Going to that address, a sergeant in civilian clothes intercepted the resident, a heavyset man named Jacob Rosenzweig, who made a dash to escape before being seized. More police came and, drawing their revolvers, saved the struggling Rosenzweig from being lynched by a crowd that was gathering. When Pickett identified the prisoner as the man who had sent the trunk, Rosenzweig, who protested his innocence vigorously, was arrested and confined in the Tombs. The woman who brought the trunk was not found, however, neither then nor later. A German Jew who had come to this country from Russian Poland in 1865, Jacob Rosenzweig was a bull-necked, burly man with a mustache and red goatee. A former saloonkeeper, he was indeed an abortionist with an office in Amity Place who practiced under the name Dr. Ascher and, like many of his colleagues in the business, displayed a bogus medical degree that he had obtained for forty dollars from an institution in Philadelphia. Under the heading “MEDICAL” in the Herald, his ads read as follows: “Dr. Ascher. Ladies in trouble guaranteed immediate relief, sure and safe; no fees required until perfectly satisfied.” Which was pretty obvious. In his August 23 exposé St. Clair had described Rosenzweig as a man of about forty who claimed to be Russian but had the “twang” of a German Jew, which he tried to reproduce: “These other fellows are all humpugsh; they bromise to do someting vot they don’t do. I poshitively do all operashunsh widout any danger, and as sheap as anybody.” Reporting his arrest, the Times of August 29 described Rosenzweig as fat, coarse, and sensual-looking, with no hint of refinement in his person or manners, thus contributing to the public image of a man who would soon be labeled “the Fiend of Second Avenue.” And in the Times of August 30 reporter St. Clair told how, when he interviewed Ascher/Rosenzweig for the exposé, the abortionist became suspicious, called him a spy and a devil, and threatened to kill him; only by himself drawing a revolver did the reporter manage to escape. A dramatic incident, certainly, but one wonders why it wasn’t mentioned in the exposé itself, rather than days later after Rosenzweig’s arrest. The papers of August 31 announced that the victim had at last been identified by a physician and a dentist who had attended her. She was Miss Alice Bowlsby, age 20, of Patterson, New Jersey, a young woman of good reputation, the daughter of a dressmaker. She had left the home of her aunt in Newark on a train bound for New York, saying she was going home to Patterson, and had not been seen by friends or family since. Learning this, the police searched Rosenzweig’s home again and found, in a heap of clothes near a wash tub, a handkerchief with faint letters in a corner that, under magnification, proved to be “A. A. Bowlsby.” At last, hard evidence! But what of the man in the case? Alice Bowlsby’s aunt said that Walter F. Conklin of Patterson, the son of a silk mill owner, might have become intimate with her niece. On August 31 young Conklin took out a gun and killed himself, leaving this note: “I have had a morbid idea of the worthlessness of life, and now to be obliged to testify in this affair and cause unpleasantness to my family is more than life is worth. Good by, dear father, mother, brother and sister. Walt.” With all Patterson agog, the tragedy was complete. And the accused? Though at times dejected, he continued to assert his innocence, saying that people believed him to be a rich Jew and had therefore had him incarcerated, hoping to extract his fortune from him by persecution. His wife and fourteen-year-old daughter Rosa, who were allowed to visit him, supported his claims of innocence, and he quickly retained an attorney. And who was that attorney? William Howe, who was just beginning his career as the most notorious and successful defense attorney of the day, the bejeweled elephant and flamboyant courtroom lawyer (some would say mountebank) described in post #29. Howe’s appearance in the case guaranteed that it would be lively, since he had a knack for winning acquittals for defendants seemingly doomed to the gallows. Howe went with his client to the coroner’s inquest at Bellevue on September 1, where Rosenzweig showed no hint of anxiety. But in the face of abundant incriminating testimony – the boy Paddy, the truckman, a servant of Rosenzweig’s who had seen a young woman arrive at her employer's home, an undertaker whom Rosenzweig had consulted, Alice Bowlsby’s physician and dentist, and others – Howe could not prevent the verdict: peritonitis due to an abortion by Rosenzweig between August 23 and 26. When Howe and a policeman accompanied Rosenzweig by carriage back to the Tombs, a crowd of several hundred hissed and groaned at Rosenzweig, who would have been assaulted if he had been on foot. Meanwhile the arrest of several other abortionists kept the public’s indignation at a fever pitch. Even the Herald joined in, denouncing the “unscrupulous quacks who ruin health and morals, at so much per head, without regard to medicine or law” – quacks whose ads it was still willing to print, minus that of Ascher/Rosenzweig. Indeed, Rosenzweig's notoriety as the Fiend of Second Avenue now eclipsed even that of Thomas Lookup Evans, the "Ghoul of Chatham Street" (the Herald was always generous with epithets), who in May of that year had been convicted of an attempt to commit manslaughter (i.e., abortion) and packed off to do three and a half years at hard labor in the state's most celebrated repository of felons, Sing Sing. When Rosenzweig’s trial in the Court of General Sessions opened in October (things moved faster in those days), with Recorder Hackett presiding, District Attorney Garvin told the jury that killing an unborn child was murder and worthy of the gallows, though the worst the defendant could receive was a mere seven years in prison. Never, he insisted, had so strong and clear a case as this one been presented to a jury. Then, calling the same witnesses who had appeared at the Coroner’s inquest, he wove a tight web of circumstantial evidence. After that, Howe presented the defense: a Mrs. Bowlsby of Brooklyn who said her daughter Anna lost a handkerchief during a visit to Rosenzweig and his family; three witnesses who testified that Rosenzweig was a man of good character; and Rosenzweig himself, who insisted that he had never had dealings with Alice Bowlsby or the truckman, and had never performed an abortion. Then, in a surprise move to clinch his case, the prosecutor called Nellie Willis to the stand, a young woman who testified that she herself had had an abortion by instruments from Rosenzweig, with subsequent bleeding that necessitated a stay in a hospital. This testimony was significant because, given the public attitude toward abortion and bearing a child out of wedlock, witnesses in abortion cases were hard to find and, when found, had a way of disappearing. William Howe’s two-hour summary claimed that the corpse sent to the Morgue was not Alice Bowlsby, whose mother never viewed it to identify it; that Conklin probably procured her death to protect himself, then sent the body to the house of an alleged abortionist, and finally killed himself to avoid exposure; that the handkerchief belonged to Miss Bowlsby of Brooklyn; and that the prosecution had offered no positive evidence that Rosenzweig was an abortionist. Though his final plea for his client had the wife and daughter in tears, this was, I suspect, one of Howe’s less inspired efforts, involving an alternative explanation that reached the levels of fantasy, and the amazing coincidence of another A. Bowlsby and her handkerchief. As regards the Mrs. Bowlsby who testified, it should be remembered that Howe had an army of auxiliaries available -- for proper remuneration -- to add their tears or cheers in the courtroom as needed, and to offer whatever testimony seemed appropriate. The district attorney’s summary presented movingly the plight of a young girl who, when ruined and betrayed by her seducer, in desperation sought out one of the scoundrels advertising in the papers. The Recorder then discredited the evidence of Mrs. Bowlsby of Brooklyn as hearsay, and urged the jury not to be influenced by prejudice against the defendant or by sympathy for his family. Sent out to deliberate, the jurors were back in less than two hours with a verdict: guilty of murder in the second degree, the prescribed penalty for causing death by abortion. The Recorder then addressed the defendant, calling him a man of uncommon nerve and dangerous, and sentenced him to the maximum term possible of seven years in state prison at hard labor. So ended the case of the Fiend of Second Avenue, or so it seemed. But not if you know William Howe and his partner Abe Hummel (post #30), and what they were capable of. While their client was busy at hard labor in the state prison at Sing Sing and then at Auburn, where he complained that "Howe didn't do a damned thing for me," they were giving hard scrutiny to the prosecution’s case and the new and tougher abortion law that the state legislature passed in April of 1872. Then, in November 1872, Howe argued in the State Supreme Court that the last-minute testimony of Nellie Willis was illegal, since it constituted a separate charge not included in the indictment, for which the defense was therefore not prepared. The court had to agree and so reversed the conviction, ordering a new trial. 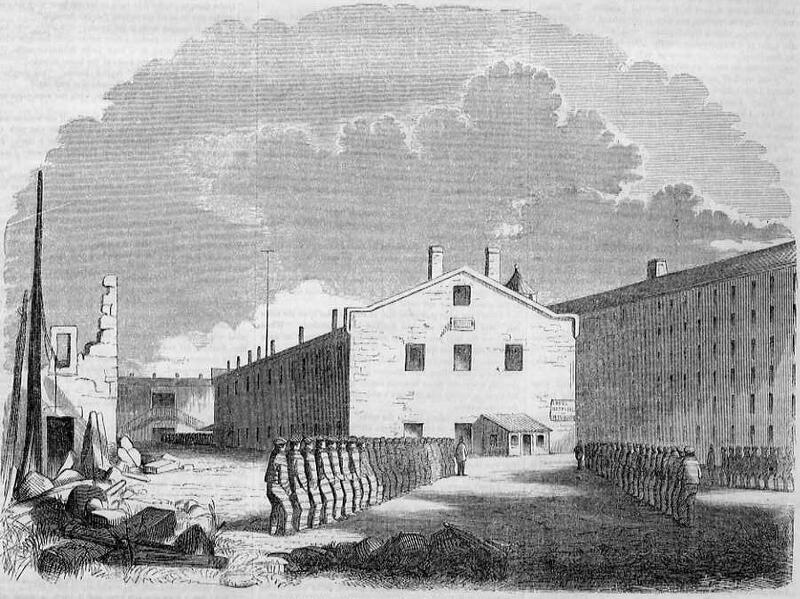 Rosenzweig was immediately brought from Auburn back to the Tombs in New York City, pending the second trial. Poland has no Friends – I am a Polander – I have no Friends – I am poor – God knows that I am not the man who committed the terrible deed, the Press are doing all they can to prejudice my case, all I ask is Fair play under the law, will You do as much for a unfortunate man without money or rich friends as to let these few lines appear in your great paper from the countryman of Pulaski and Koscuski. It should be remembered that Rosenzweig came to this country from Russian Poland in 1865, just two years after a Polish revolt was crushed by Russia while the rest of Europe remained aloof. Unmoved, the Times in printing Rosenzweig’s note announced that it would be very glad to see him brought to the gallows. The matter dragged on, as legal matters do, but on November 13, 1873, Judge Sutherland of the Court of General Sessions agreed that there was indeed no law under which even so notorious a criminal as Rosenzweig could be kept in custody, and therefore discharged him into the arms of his overjoyed wife and daughter, and a crowd of friends who congratulated him on his good fortune. The Times denounced the legislature’s “hasty and bungling legislation,” but since abortion cases were almost ever tried again -- prosecutors were too overburdened, and witnesses too elusive -- the Fiend of Second Avenue was now free as a bird. What then became of him isn’t clear, but one suspects that he wasted little time in departing from the city where he was somewhat less than persona grata. Many aspects of the case were ignored by the press of the time. Why, for instance, were there so many abortionists? Obviously, because there was great demand for abortion. And why was that? Because unmarried women like Alice Bowlsby dreaded the disgrace of bearing a child out of wedlock, and this country, unlike many in Europe, had no foundling hospitals where such women could give birth discreetly without compromising their reputation. But respectable married women with large families, lacking knowledge of birth control, also sought out abortionists so as to escape the burden of further childbearing. Not to mention actresses with obligations, and women so in the social swim that they couldn’t bear to miss the season because of pregnancy. Also, it's worth keeping in mind that in those days, when doctors were just beginning to wash their hands and sterilize their instruments before attending women in childbirth, the mortality rate among women giving birth was high. So the demand for abortion was great, and many unskilled adventurers were happy to meet it … for a price. The situation didn’t change anytime soon. In 1873 the zealous puritanical reformer Anthony Comstock (more of him in a future post) got Congress to pass what became known as the Comstock law, banning obscene matter from the mail, “obscene” being construed to include any article intended to prevent conception or procure abortion. This legislation, which even forced medical manuals to eliminate certain illustrations so as to comply with the law, was enforced well into the twentieth century, and many states enacted even stricter laws. With time, however, public opinion changed, the law was undermined in various court decisions, and in 1983 the Supreme Court finally declared key aspects of the law unconstitutional. for which there is little basis in fact; and some are blissfully unaware of the final disposition of the case, whereby Rosenzweig was set free. Facsimiles of some of the Times’s articles reporting the case are available online, but I have relied instead on my notes from the press of the period, primarily but not exclusively the Times, taken while doing background research for my biography of Restell: The Wickedest Woman in New York: Madame Restell, the Abortionist (Archon Books, 1988). Aha! some of you are now exclaiming: clever Browder, he’s drumming up sales for his book, hoping to sluice money from our impoverished pockets into his own. Ah, if only that were the case! But alas, no, the book is long out of print and available only in reference libraries or second hand online at an outrageous price, not a penny of which comes to me. A good free compendium of the book that includes direct quotes is available at victoriangothic.org. Thought for the day: Silence: our end and origin.